A Sweet little Adventure in My blog! Sweet Tutorials! Check this out! Hi! 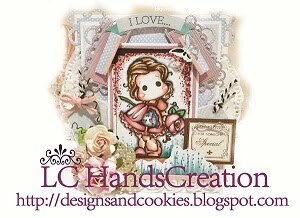 Welcome to my blog... it is Designs and Cookies!! Yeah i love cookies so much, makes my life sweeter than ever. This is my first post. I love all magnolias stamps so much, and decided to share my creation's here, but it does not mean that i don't like others stamps. I love all type of stamps and would like to try it and colour it(exclude adults contents type stamps) My mom wil have a heart attack if she saw me coloured stamps that have adult contents. :D.
I want to share my card today. Themed " Love is all around", because valentine is drawing near. Don't want to miss it. I'm using Tilda with Big Big Rose. I love her image. So cute. Tilda with Big Big Rose Image, Magnolia dies, Copics, Nesting Dies, I am Roses flowers, Marianne designs dies, Eco Green cardstock, Roce lace with pearls, Doily paper, glue and Foam Tape. Thank you so much for stopping by. I will post some tutorials next month. Thanks again. See you later!! This is gorgeous!! I love the colors! Thanks for joining us at I Am Roses!! 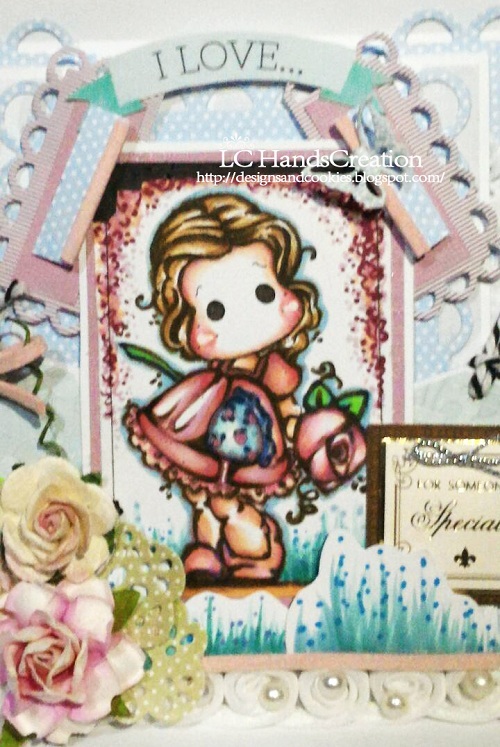 Great card, thanks for joining us at the Craftliners challenge. This is stunning!! Thanks for joining us at Magnolia-licious Challenge Blog!! What a lovely card thanks for joining us at TFMC. Hi Helena! Your card is beautiful! I'm so glad to be your first follower :) Hope to see more beautiful creations from you. Very pretty card! Fabulous coloring. Thanks for joining us at Magnolia Licious. Hello Helena! Nice to meet you. Your card is super adorable and I love how you used the IAR flowers on it. Thanks for joining gout January challenge. 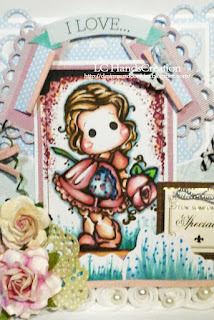 Stunning card Helena, welcome to the world of blogging! Thanks for entering your Lace and Pearls creation at Simply Magnolia and good luck! What a gorgeous card Helena! Your colouring is awesome and you did a fab job with all those diecuts and other embellies.. I love it <3 thanks for joining us at all about magnolia. I love handmade cards and cookies. I love coloring, cute things and many more. I just want to share my creations here.